Need for Speed: Most Wanted (2012) (also abbreviated as NFS: MW or simply Most Wanted) is a open-world racing video game developed by British games developer Criterion Games and published by Electronic Arts. Announced on June 4, 2012, during the E3 press conference, Most Wanted is the nineteenth and currently the newest title in the long-running Need for Speed series. The game picked up on the Most Wanted IP, as opposed to the Hot Pursuit reboot that Criterion developed previously. Need for Speed: Most Wanted trailer. Need for Speed: Most Wanted has the gameplay style of the original Most Wanted in the Need for Speed franchise. 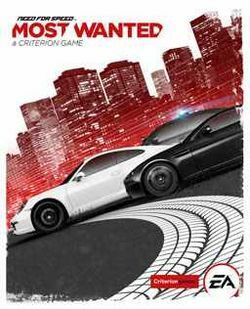 Most Wanted allows players to choose a car and race against three other racers in three types of races: Sprint races, Circuit races, and Speed runs. Sprint races go from one point of the city to the other. Circuit races involve going around a track in a loop for three laps. Speed runs are where racers go through the designated course at the highest average speed possible. There is also Ambush races, which starts with the player surrounded by cops and being tasked to evade the pursuit as fast as possible. Cops are integrated only into certain races, in which the police deploy several vehicles and tactics to stop and arrest the player, similar to the original Most Wanted. At each event there is two upgrades that can be unlocked for the player's car, one of them is obtained by finishing in second and the other is obtained only by winning. The game features a Blacklist (also known as The Most Wanted List) of ten racers, similar to the 15 Blacklist racers in the original Most Wanted. As the Most Wanted racers are defeated, their cars are added to the player's roster. In this game, the focus shifts from the city of Rockport in the original game to a new city called Fairhaven. Most Wanted has been likened to the Burnout series. Like Burnout Paradise, races have a start and end point, but players can choose their own route to the finish line, which is different than the original game but similar to the "crew challenges" in Carbon. There is also destructible billboards, fences, and drive-through repair garages which all originated from Paradise. The game also uses Autolog, which is a competition-between-friends system developed by Criterion for Need for Speed: Hot Pursuit, which has since been used in other titles in the Need for Speed series. Autolog in Most Wanted plays a larger role and now gives more information to players. Activities in-game allow players to earn Speed Points which can boost players up on The Most Wanted list. Autolog recommendations have now been integrated into the game world, rather than sit externally in the menu system. Most Wanted has a new social system called Cloudcompete, which puts together Most Wanted across all platforms as an inspired example of cross-compatibility. One profile is used for all versions of the game, allowing the player to rank up on one format and continue progress on the other. The driving model of the game is described as not as arcade-styled as the Burnout series and Hot Pursuit, but far from a simulator. Most Wanted has a selection of real-life vehicles, with a mix of muscle cars, street racers, and exotics. The cars can be customized with visual and performance upgrades, such as paint colors, reinflatable tyres, suspensions, engine, nitrous oxide, and body work that enables players to break through roadblocks. There is a feature called EasyDrive that enables players to customize their vehicles while in action. For the first time in Need for Speed history, all of the cars are available from the start, hidden in locations throughout Fairhaven; the player has to discover them in order to unlock them. In addition, the Wii U version features three unique features to make it the "Enhanced Version". The Wii U version includes a new co-op feature that allows players to to team up with friends. The new local co-op mode, called Co-Driver, lets one player drive using the Wii Remote or the Wii U Pro Controller and another player use the GamePad to provide control and navigation assistance on an interactive real-time map. Additionally, the Wii U version supports full gameplay on the GamePad, allowing users to play seperately from the TV. The GamePad can also be used to change mods and switch cars. The Wii U version also includes content from the previously-released Ultimate Speed Pack on-disc. This page was last edited on 2 March 2018, at 14:38.